As promised..! We ambushed and interrogated, oops I mean - interviewed our Family & Friends tournament champion, and a recently emerged supercatcher who won't let almost anyone else to the top of the Stall Catchers leaderboards anymore... Badstallsbadbad ! 1. Where are you from? Where are you based? How old are you? 2. How did you discover Stall Catchers? Bad: I suffered the most devastating loss of my life just short of 3 years ago. I went looking to learn some things, then I thought I had to be part of some things and found out I could be so here I am. 3. Was it easy to grasp how to play? 4. How did you get so good so fast? Do you have any tips to share with other catchers? Bad: Just keep playing, don't stop, just keep playing. Forget your score, forget the blue bar, just play. 5. Why do you play the game? What's your main motivation? Bad: We all have this chance to help aid real research, not a game to introduce people to concepts but to help the people who are the ones that are going to find the cures. Maybe if the world sees what a bunch of like minds can do when they pull in the same direction, things will change. Not just ALZ, but lots of things that we could all afford to be rid of. Egle: We so completely agree with that, Bad, and that is in fact part of our mission at the Human Computation Institute (not just EyesOnALZ) ! 6. Do you have any links with Alzheimer's? If so, has it been part of your motivation? 7. What's your background? Do you feel it is in any way related to the game? Bad: Nothing of any note, just one of 7 or so billion. Of course I'm related to the game, I made a name up for the chatbox! 8. Do you participate in other citizen science projects? If so, what are they, and how do they compare with Stall Catchers in your opinion? Bad: How do they compare? Apples to Oranges in "playing"(code for working), but the same underlying motivation. Depends what you are "good" at, some people are better at looking at things, some people are better at reading and comprehending. "Everyone" can do both but which you favor determines whether helping becomes a slog or a walk in the park. Bad: See answer #5 We all have this chance to help aid real research, not a game to introduce people to concepts but to help the people who are the ones that are going to find the cures. Egle: Again - well said! 10. How do you feel about the community of catchers? 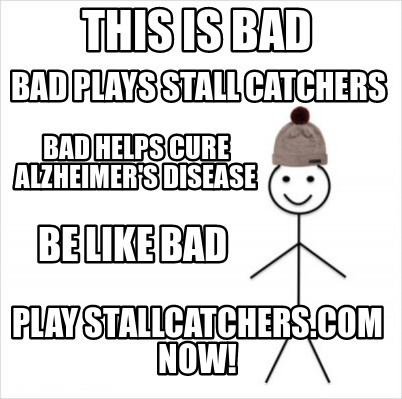 Do you know any other catchers in person? Bad: The fact that these people are doing this knowing what the are actually doing, whether they do one or a billion films, they are fine people. Then when you start cracking jokes with some of them and throwing around stupid emojis, well, what's not to like!? As far as knowing any personally, no, not a one. 11. If you could have one feature in Stall Catchers tomorrow, what would it be? Bad: Can't think of anything that is missing. Bad: We are helping things happen faster, if "we" don't cure it, we will at least free up other labs to say, "this was done at Cornell and it led nowhere so we can skip that..."
Egle: Yes! This is very important, yet sometimes overlooked (the importance of "negative" results), and Stall Catchers gives us just that -- freedom to explore more paths, because otherwise, it's just guesswork! Wonderfully explained by Nozomi in this video as well. Bad: Time is of the essence since we're talking about people living or dying in the long run and some of those people may be you who are reading these words. After that sobering thought, smile, we're working on it! Egle: OMG, yeah... As scary as that thought is, any one of us can be accumulating amyloid right now, which could someday reach the threshold and set off the Alzheimer's cascade of events in our brains. But not if we find a way to prevent or cure it first !!!!! 13. Anything else you'd like to share... ? I'd like to share....my yardwork (soon to be snow shoveling). Anyone want to grab a shovel? Thank you Badstallsbadbad, for sharing your experience of catching with the rest of us! 💜 May the force be with you, and the game be fruitful! For more stories on "The Humans of Stall Catchers" check out this blog category.